Sequential has announced that its Prophet 12 synth is about to be discontinued, but the company is seeing it off with a limited edition ‘arctic white’ edition. When we say limited, we really do mean it: only 100 Prophet 12 LEs will be made. After these have rolled off the production line, this hybrid analogue/digital instrument will be no more (unless you’re lucky enough to own one, that is). Feature-wise, the Prophet 12 LE is the same as the standard model. As well as the white colour scheme, it also has maple end caps. 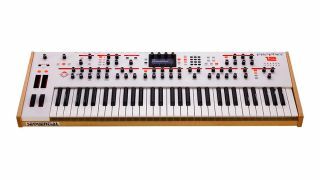 Of course, with the discontinuation of the Prophet 12, people are bound to speculate on what, if anything, might take its place in the Sequential product line. And with NAMM 2019 just around the corner, we might not have long to wait before we find out. The Prophet 12 LE will be available in December priced at $2,999. Find out more on the Sequential website.